Brucella spp. are facultative intracellular pathogens that have the ability to survive and multiply in professional andnonprofessional phagocytes and cause abortion in domestic animals and undulant fever in humans. Brucella species cansurvive in a variety of cells, including macrophages and their virulence and chronic infections are thought to be due to theirability to avoid the killing mechanisms within macrophages. Inhibition of phagosome-lysosome fusion has been proposed asa mechanism for intracellular survival of Brucella in professional and nonprofessional phagocytes. Toll-like receptors (TLRs) arepart of a skillful system for detection of invasion by microbial pathogens. Recognition of microbial components by TLRs triggerssignaling pathways that promote expression of genes and regulate innate immune responses. Recent studies for the interactionbetween TLRs-Brucella have indicated the importance of control of Brucella infection. Here, we review selected aspectsof TLRs-Brucella interaction, which may be helpful to understanding the mechanism of Brucella pathogenesis. Brucellosis known as undulant fever in humans is a major zoonotic disease that causes a serious debilitating disorder in humans and abortion and sterility in domestic animals. Brucella spp. are small Gram-negative and facultative intracellular bacteria, which can multiply within professional and nonprofessional phagocytes [21, 22]. The genus Brucella consists of six well-recognized species classified according to host preference - B. melitensis (sheep and goats), B. abortus (cattle), B. suis (hogs), B. ovis (sheep), B. canis (dogs) and B. neotomae (wood rats) . In recent years, Brucella has been recovered from several marine mammals, including cetaceans and pinnipeds. These marine isolates belong to two potential new species, B. pinnipedialis and B. ceti . A new species of Brucella, B. microti, was recently isolated from wild common voles suffering from a systemic disease [32, 59]. B. melitensis, B. abortus and B. suis strains cause abortion and infertility in their natural hosts - goats and sheep, cattle and swine, respectively. Humans can also acquire a severe, debilitating febrile illness known as Brucellosis, resulting from contact with infected animals or their products . B. ovis, a natural pathogen of sheep, primarily causes epididymitis and infertility in rams . B. canis infection causes abortion and infertility in dogs [23, 67]. Although B. ovis and B. canis are important in animals, human infection with B. canis is rare , and human infection with B. ovis has not been reported. B. neotomae, a Brucella strain that infects only desert wood rats is not known to be associated with clinical disease in any host species. Contrary to other intracellular pathogens, Brucella species do not produce exotoxins, antiphagocytic capsules or thick cell walls, resistance forms or fimbriae and do not show antigenic variation . The ability of Brucella to avoid the killing mechanisms within macrophages is thought to be the key aspect of their virulence [58, 64]. In brucellosis, respiratory, digestive, and genital tracts are the most common point of entry for both animals and humans. Brucella enter phagocytic cells at an unknown cellular site and spread throughout the body by the regional lymph nodes. Brucella show high tropism in macrophages; in particular, the monocytes and liver, spleen, mammary glands, and reproductive tracts are the main tissues of preference. Bacterial resistance to host immune response and the debilitated health status of the host is the main cause of chronic brucellosis . A tenth of the total Brucella will survive to avoid phagocytosis and penetrate cell membrane for intracellular growth; macrophages are the most important for achievement of a successful infection. During the infection, interference with macrophage function is observed, namely the inhibition of IFN-g  and TNF-a expression , and the reduction of antigen presentation and subsequent T cell activation . Brucella inside dendritic cells (DC) contributes to chronic infection and induced low levels of proinflammatory cytokines and increased MHC II expression . Placental trophoblasts produce erythritol during the last trimester and increase the carbon source for Brucella. Brucella caused abortion or stillbirth of infected foetus by inducing placental damage  and targeting giant trophoblasts . Brucella have also been reported in other cell types and were studied with cell models and lines, including human pulmonary epithelial cells , caprine uterine epithelial cells , human osteoblastic cells , murine neurons , bovine and human polymorphonuclear  and many other cells lines. In addition, surprisingly, extracellular brucellae were observed on the 21st day post infection . When unopsonized B. melitensis, B. abortus and B. suis strains internalize into macrophages and epithelial cells, the Brucella-containing vacuoles (BCVs) enter into an intracellular trafficking pathway, leading to development of specialized membrane-bound compartments [1, 15, 36, 45, 50, 54] known as replicative phagosomes  or brucellosomes . Interactions between the O-chain of the smooth LPS of these Brucella strains and lipid rafts on the surface of macrophages have been shown to be important for mediating entry into host cells in a manner leading to development of the replicative phagosome . During the initial stages of intracellular trafficking of BCVs, these compartments suffer temporary interactions with lysosomes , resulting in their acidification [1, 51]. These vacuoles begin to interact extensively with the endoplasmic reticulum . Eventually their intracellular pH rises to a level that allows intracellular replication of Brucella. During development of the replicative phagosome in epithelial cells, BCVs acquire properties resembling those of autophagosomes , however, this does not appear to be the case during development of BCVs in macrophages . Studies employing the human monocytic cell line THP-1 and B. abortus strains opsonized with hyperimmune IgG have also shown that when Brucella internalize host macrophages in this manner, the resulting BCVs also undergo temporary association with the lysosomal compartment and become acidified, however, these BCVs do not interact extensively with the ER . An obvious potential benefit of this altered intracellular trafficking is that limiting the fusion of BCVs with lysosomes minimizes exposure of these bacteria to the bactericidal proteins that reside in these intracellular compartments . Toll-like receptors (TLRs) are the best characterized pattern recognition receptors (PRRs). Receptor-ligand interaction via TLRs leads to production of antimicrobial peptides and proinflammatory cytokines through NF-κB, mitogen-activated protein kinase (MAPK) and other signaling pathways . As a result, TLR signaling is critical to development of the host innate immune response, including recruit- ment of DCs and T effector cells, and upregulation of MHC I and II on antigen presenting cells (APCs) and by extension adaptive immunity against infection. In Brucellosis, many studies have reported that TLRs play important role in control of Brucella infection. In this review, we will discuss the key roles of TLRs including immune response, signal transduction cascade, and phagocytic pathway for Brucella infection within host cells. TLRs are single-pass type I transmembrane-spanning proteins characterized by a single intracellular Toll/interleukin-1 (IL-1) receptor (TIR) domain and multiple extracellular leucine-rich repeats (LRRs), which is responsibile for binding to ligands . TLRs recognize and are activated by a small collection of microbe-derived molecules (Fig. 1). 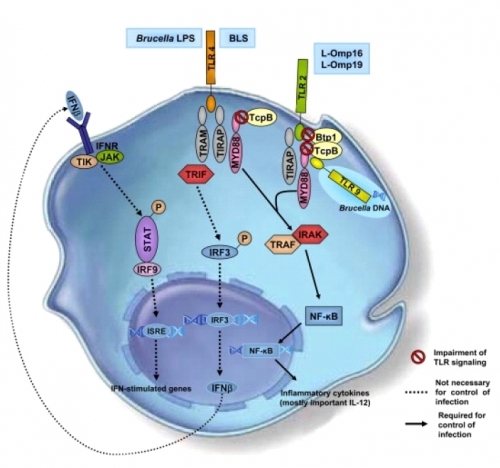 Through studies of targeted mutants, among 13 paralogous TLRs, 10 in humans and 12 in mice, the diverse mode of ligand recognition of individual TLRs was determined, except for TLR8, TLR10 (only present in humans) and TLR11–13 (only present in mice). Lipopeptides and other components of Gram-positive bacterial cells activate TLR2 in conjunction with either TLR1 or TLR6; accessory protein MD-2 is necessary for recognition LPS of TLR4; flagellin is detected by TLR5; poly I:C, a double-stranded RNA (dsRNA) analog, is detected by TLR3; unmethylated DNA and CpG-oligodeoxynucleotides (CpG-DNA) are detected by TLR9, in which Granulin and high mobility group (HMG) B proteins have been proposed to deliver CpG-DNA to TLR9 through an ability to bind simultaneously to both CpG-DNA and TLR9; and single-stranded RNA and its synthetic analogs resiquimod, imiquimod, and loxoribine activate TLR7. Despite the variation in modes of ligand recognition, all known TLR dimer structures show the same arrangement, with the two carboxy-terminal tails closely juxtaposed and the amino termini at opposite ends of the dimer [2, 9, 10, 44]. This conformation may be required in order to bring the intracellular TIR domains into close proximity for initiation of signaling. Toll-like receptor (TLR) activation can induce cell-intrinsic antimicrobial activity. For example, activation of TLR2 and TLR4 can lead to assembly of NADPH oxidase as well as relocalization of mitochondria to the bacteria-containing phago- some, leading to a burst of reactive oxygen and nitrogen species within this compartment [39, 65, 69]. Evidence suggests that TLR signaling can cause rapid acidification of the phagosome in which TLR signaling has occurred, likely through recruitment of vacuolar-ATPase subunits to the phagosomal membrane [3, 9, 10, 63]. These activities increase the antimicrobial capacity of the phagosome, although some bacteria have actually coopted these signals for use in regulation of their virulence programs. Detection of microbial ligands by TLRs can also induce expression and secretion of antimicrobial peptide (AMPs), such as β-defensins and cathelicidin, further supporting the role of TLR-mediated detection in cell-intrinsic antimicrobial activity [53, 55, 61]. However, bacteria have attempted to avoid TLR signaling by altering their surface structures, interfering with TLR signaling pathways or escaping, inhibiting, or subverting phagocytosis . Brucella spp. are recognized by TLR2, TLR4 and TLR9, which identify lipopolysaccharide (LPS), lipoproteins and bacterial DNA, respectively . Fig. 1. TLR signaling elicits inflammation. 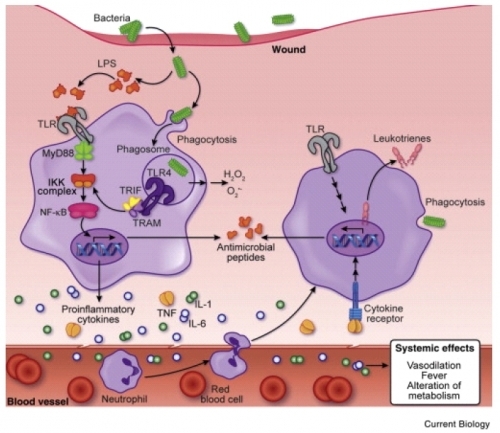 Pathogens, such as bacteria, may enter the host through a breached epithelial barrier, leading to activation of macrophage TLRs by pathogen-derived molecules, including LPS. TLR signaling leads to the production of inflammatory cytokines, which act near the site of infection to recruit neutrophils and induce neutrophil production of antimicrobial molecules, including peptides, reactive oxygen species (e.g. H2O2 and superoxide anion), and leukotrienes. Cytokines also travel throughout the body and induce systemic effects. Both macrophages and neutrophils act to limit infection by phagocytosis of pathogens . Involvement of TLR2 and TLR4 in recognition of Brucella was reported in several studies. The former was proposed to induce secretion of TNF-α, IL-6, IL-12 and IL-10 in peritoneal macrophages stimulated by B. abortus lipoproteins, such as Omp16 and Omp19 , the major Brucella TLR2 ligands responsible for pro-inflammatory response, however, no role was observed in control of the pathogen in vivo (Fig. 2) . Involvement of TLR4 was demonstrated in B. melitensis resistance in cooperation with TLR9, which has been shown to play a more prominent role during Brucella infection . Interaction of TLR4 with non-canonical Brucella LPS induces activation of NF-κB, expression and its interaction with lumazine synthase from Brucella spp. stimulates maturation of dendritic cells  and increases expression of co-stimulatory molecules and major histocompatibility class II as well as production of IL-6, TNF-α, and IL-12p70 . Fig. 2. TLR signaling in response to Brucella in macrophages or dendritic cells. Recognition of Brucella's pathogen-associated molecular patterns (PAMPs) by TLR2 (Outer membrane proteins, Omp16 and Omp19), TLR4 (Brucella LPS, Brucella lumazine synthase- BLS) and TLR9 (Brucella-DNA) activates intracellular signaling via MyD88 resulting in the activation of NF-κB, MAPKs and production of proinflamatory cytokines, mostly important IL- 12. A possible role for subversion of TLR signaling by Brucella producing TIR domain-containing proteins is detailed (Btp1 and TcpB). Btp1 acts in TLR2 and TcpB interacts with MyD88 interfering in TLR2 and TLR4 signaling. Solid arrows represent the important TLR pathways to control Brucella infection. Discontinuous arrows represent TLRs and type I IFN receptor signaling which are not necessary for Brucella clearance. Barred circle represents the impairment of TLR signaling by Btp1 and TcpB proteins . Absence of MyD88 protein during Brucella infection impairs maturation of dendritic cells and production of IL-12 and TNF-α in macrophages and dentritic cells , and reduces levels of inflammatory chemokines RANTES (CCL5), MCP-1 (CCL2), and MIP-1α (CCL) . This molecule is required for development of IFN-γ producing T cells and control of brucellosis , suggesting that Th1 response induced during the infection is regulated by a MyD88-dependent pathway . In addition, the molecule is used by other inflammatory signaling pathways, including IL-1 and IL-18 . However, no role of IL-18 in control of murine brucellosis was observed . Brucella appears to interfere in TLR signaling through production of inhibitory homologues of Toll/interleukin-1 receptor (TIR) domain, such as B. abortus Btp1, which acts in TLR2 signaling down-modulating maturation of dendritic cells and secretion of pro-inflammatory cytokines  and B. melitensis TcpB, which has been shown to interact with MyD88 in vitro, impeding TLR2 and TLR4 signaling and secretion of pro-inflammatory cytokines . These proteins then suppress innate immunity and cause increased virulence . The role of TLR2 in Brucella infection remains controversial. Some studies have suggested that TLR2 is not required for control of Brucella infection in mice [13, 17, 68]. However, other studies have indicated that TLR2 is important for clearance of Brucella from the lung following aerosol exposure , cytokine production such as TNFα and IL-12 [29, 30, 41, 68, 70], MHC-II expression  and down regulation of the type I receptor for the Fc portion of IgG (FcγRI, CD64) . The role of TLR4 in Brucella infection also remains in dispute. Some studies have suggested that TLR4 is required for control of Brucella replication in mice [13, 17, 41], while others have reported that TLR4 is not involved [4, 68]. Lee et al. reported that TLR4 linked Janus kinase 2 (JAK2) plays an essential role in phagocytosis of B. abortus by macrophages. 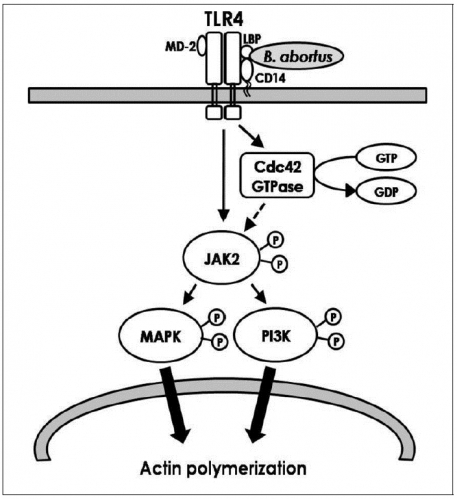 TLR4-associated activation of JAK2 in early cellular signaling events plays a pivotal role in B. abortus-induced phagocytic process in macrophages (Fig. 3), implying the pathogenic significance of JAK2-mediated entry . However, they play diverse roles in the Brucella antigen specific antibody production and antibody class switching . Fig. 3. Diagram illustrating the phagocytic signaling pathway initiated by TLR4-linked JAK2 activation during the internalization of B. abortus into macrophage. The interaction of B. abortus with TLR4 induces the activation of Cdc42 GTPase and JAK2, and the subsequent activation of PI3K and MAPKs promotes actin polymerization. This event contributes to the phagocytosis of B. abortus by macrophage. Lines with arrows denote an activating reaction and dotted line denotes uncertainty of the reaction . TLR6 is an important component for triggering an innate immune response against B. abortus. TLR6 is recruited to the macrophage phagosome, where it recognizes bacterial peptidoglycan and lipoproteins . TLR6 plays a role in recognition of bacterial diacylated lipopeptides such as MALP2, however, it is not essential for cytokine production in response to triacylated lipopeptides. TLR6 cooperates with TLR2 in sensing Brucella and further activates NF-κB signaling in vitro. However, TLR6, not TLR2, is required for efficient control of B. abortus infection in vivo . TLR9 plays a role in control of B. abortus infection in mice [41, 68]. In addition, heat-killed B. abortus induces expression of IL-12 by dendritic cells, which is partially mediated by TLR9 . TLR9 plays a significant role in preventing replication of B. ovis in vivo, however, only MyD88 is required for wild type levels of inflammation . Throughout this study, we described the interaction between Brucella and TLRs, including interaction of specific molecules (ligands), immune response and signal cascade, and strategies for control. This review may be helpful to understanding the pathogenic and defense mechanisms of Brucellosis. In addition, understanding of TLRs mediated control of intracellular parasitic bacterial infection would be helpful to eradication of these diseases. The work was supported by iPET (Korea Institute of Planning and Evaluation for Technology in Food, Agriculture, Forestry and Fisheries) (112012-3), Ministry for Food, Agriculture, Forestry and Fisheries, Korea. 1.Arenas GN, Staskevich AS, Aballay A, Mayorga LS. Intracellular trafficking of Brucella abortus in J774 macrophages. Infect Immun. 2000, 68(7):4255-4263. 2.Arpaia N, Barton GM. The impact of Toll-like receptors on bacterial virulence strategies. Curr Opin Microbiol. 2013, 16(1):17-22. 3.Arpaia N, Godec J, Lau L, Sivick KE, McLaughlin LM, Jones MB, Dracheva T, Peterson SN, Monack DM, Barton GM. TLR signaling is required for Salmonella typhimurium virulence. Cell. 2011, 144(5):675-688. 4.Barquero-Calvo E, Chaves-Olarte E, Weiss DS, Guzman-Verri C, Chacon-Diaz C, Rucavado A, Moriyon I, Moreno E. Brucella abortus uses a stealthy strategy to avoid activation of the innate immune system during the onset of infection. PLoS One. 2007, 2(7):e631. 5.Barrionuevo P, Cassataro J, Delpino MV, Zwerdling A, Pasquevich KA, Garcia Samartino C, Wallach JC, Fossati CA, Giambartolomei GH. Brucella abortus inhibits major histocompatibility complex class II expression and antigen processing through interleukin-6 secretion via Toll-like receptor 2. Infect Immun. 2008, 76(1):250-262. 6.Barrionuevo P, Delpino MV, Velasquez LN, Garcia Samartino C, Coria LM, Ibanez AE, Rodriguez ME, Cassataro J, Giambartolomei GH. Brucella abortus inhibits IFN-gammainduced Fc gamma RI expression and Fc gamma RIrestricted phagocytosis via toll-like receptor 2 on human monocytes/macrophages. Microbes Infect. 2011, 13(3):239-250. 7.Bellaire BH, Roop RM, 2ND, Cardelli JA. Opsonized virulent Brucella abortus replicates within nonacidic, endoplasmic reticulum-negative, LAMP-1-positive phagosomes in human monocytes. Infect Immun. 2005, 73(6):3702-3713. 8.Berguer PM, Mundinano J, Piazzon I, Goldbaum FA. A polymeric bacterial protein activates dendritic cells via TLR4. J Immunol. 2006, 176(4):2366-2372. 9.Blander JM, Medzhitov R. Regulation of phagosome maturation by signals from toll-like receptors. Science. 2004, 304(5673):1014-1018. 10.Blander JM, Medzhitov R. Toll-dependent selection of microbial antigens for presentation by dendritic cells. Nature. 2006, 440(7085):808-812. 11.Buckrell BC, McEwen SA, Johnson WH, Savage NC. Epididymitis caused by Brucella ovis in a Southern Ontario Sheep Flock. Can Vet J. 1985, 26(10):293-296. 12.Byeong kirl Baek, Jin Hur, Matsuda kiku, Min Jun Choi. Humoral Immune response of dogs experimentally ino culated with Brucella canis. Kor J Vet Publ Hlth. 2000, 24(4):289-298. 13.Campos MA, Rosinha GM, Almeida IC, Salgueiro XS, Jarvis BW, Splitter GA, Qureshi N, Bruna-Romero O, Gazzinelli RT, Oliveira SC. Role of Toll-like receptor 4 in induction of cell-mediated immunity and resistance to Brucella abortus infection in mice. Infect Immun. 2004, 72(1):176-186. 14.Caron E, Gross A, Liautard JP, Dornand J. Brucella species release a specific, protease-sensitive, inhibitor of TNF-alpha expression, active on human macrophagelike cells. J Immunol. 1996, 156(8):2885-2893. 15.Celli J, de Chastellier C, Franchini DM, Pizarro-Cerda J, Moreno E, Gorvel JP. Brucella evades macrophage killing via VirB-dependent sustained interactions with the endoplasmic reticulum. J Exp Med. 2003, 198(4):545-556. 16.Cirl C, Wieser A, Yadav M, Duerr S, Schubert S, Fischer H, Stappert D, Wantia N, Rodriguez N, Wagner H, Svanborg C, Miethke T. Subversion of Toll-like receptor signaling by a unique family of bacterial Toll/interleukin-1 receptor domain-containing proteins. Nat Med. 2008, 14(4):399-406. 17.Copin R, De Baetselier P, Carlier Y, Letesson JJ, Muraille E. MyD88-dependent activation of B220-CD11b+LY-6C+ dendritic cells during Brucella melitensis infection. J Immunol. 2007, 178(8):5182-5191. 18.Corbel MJ. Brucellosis: an overview. Emerg Infect Dis. 1997, 3(2):213-221. 19.de Almeida LA, Macedo GC, Marinho FA, Gomes MT, Corsetti PP, Silva AM, Cassataro J, Giambartolomei GH, Oliveira SC. Toll-like receptor 6 plays an important role in host innate resistance to Brucella abortus infection in mice. Infect Immun. 2013, 81(5):1654-1662. 20.Delpino MV, Fossati CA, Baldi PC. Proinflammatory response of human osteoblastic cell lines and osteoblastmonocyte interaction upon infection with Brucella spp. Infect Immun. 2009, 77(3):984-995. 21.Detilleux PG, Deyoe BL, Cheville NF. Entry and intracellular localization of Brucella spp. in Vero cells: fluorescence and electron microscopy. Vet Pathol. 1990, 27(5):317-328. 22.Detilleux PG, Deyoe BL, Cheville NF. Penetration and intracellular growth of Brucella abortus in nonphagocytic cells in vitro. Infect Immun. 1990, 58(7):2320-2328. 23.Eun-Jeong Heo, Jong-Wan Kim, Dong-Hee Cho, Hyang-Mi Nam, Yun-Sang Cho, In-Yeong Hwang, Sung-Il Kang, Suk-Chan Jung, Sung-Hwan Wee, Hee-Soo Lee. Antimicrobial susceptibility of Brucella canis isolates from dogs in Korea. Kor J Vet Publ Hlth. 2009, 33(4):213-219. 24.Ferrero MC, Fossati CA, Baldi PC. Smooth Brucella strains invade and replicate in human lung epithelial cells without inducing cell death. Microbes Infect. 2009, 11(4):476-483. 25.Finlay BB, Falkow S. Common themes in microbial pathogenicity revisited. Microbiol Mol Biol Rev. 1997, 61(2):136-169. 26.Forestier C, Deleuil F, Lapaque N, Moreno E, Gorvel JP. Brucella abortus lipopolysaccharide in murine peritoneal macrophages acts as a down-regulator of T cell activation. J Immunol. 2000, 165(9):5202-5210. 27.Foster G, Osterman BS, Godfroid J, Jacques I, Cloeckaert A. Brucella ceti sp. nov. and Brucella pinnipedialis sp. nov. for Brucella strains with cetaceans and seals as their preferred hosts. Int J Syst Evol Microbiol. 2007, 57(Pt 11):2688-2693. 28.Garcia Samartino C, Delpino MV, Pott Godoy C, Di Genaro MS, Pasquevich KA, Zwerdling A, Barrionuevo P, Mathieu P, Cassataro J, Pitossi F, Giambartolomei GH. Brucella abortus induces the secretion of proinflammatory mediators from glial cells leading to astrocyte apoptosis. Am J Pathol. 2010, 176(3):1323-1338. 29.Giambartolomei GH, Zwerdling A, Cassataro J, Bruno L, Fossati CA, Philipp MT. Lipoproteins, not lipopolysaccharide, are the key mediators of the proinflammatory response elicited by heat-killed Brucella abortus. J Immunol. 2004, 173(7):4635-4642. 30.Huang LY, Aliberti J, Leifer CA, Segal DM, Sher A, Golenbock DT, Golding B. Heat-killed Brucella abortus induces TNF and IL-12p40 by distinct MyD88-dependent pathways: TNF, unlike IL-12p40 secretion, is Toll-like receptor 2 dependent. J Immunol. 2003, 171(3):1441-1446. 31.Huang LY, Ishii KJ, Akira S, Aliberti J, Golding B. Th1-like cytokine induction by heat-killed Brucella abortus is dependent on triggering of TLR9. J Immunol. 2005, 175(6):3964-3970. 32.Hubalek Z, Scholz HC, Sedlacek I, Melzer F, Sanogo YO, Nesvadbova J. Brucellosis of the common vole (Microtus arvalis). Vector Borne Zoonotic Dis. 2007, 7(4):679-687. 33.Iyankan L, Singh DK. The effect of Brucella abortus on hydrogen peroxide and nitric oxide production by bovine polymorphonuclear cells. Vet Res Commun. 2002, 26(2):93-102. 34.Kawai T, Akira S. TLR signaling. Cell Death Differ. 2006, 13(5):816-825. 35.Kim S, Lee DS, Watanabe K, Furuoka H, Suzuki H, Watarai M. Interferon-gamma promotes abortion due to Brucella infection in pregnant mice. BMC Microbiol. 2005, 5:22. 36.Kim S, Watarai M, Makino S, Shirahata T. Membrane sorting during swimming internalization of Brucella is required for phagosome trafficking decisions. Microb Pathog. 2002, 33(5):225-237. 37.Ko J, Splitter GA. Molecular host-pathogen interaction in brucellosis: current understanding and future approaches to vaccine development for mice and humans. Clin Microbiol Rev. 2003, 16(1):65-78. 38.Kohler S, Michaux-Charachon S, Porte F, Ramuz M, Liautard JP. What is the nature of the replicative niche of a stealthy bug named Brucella? Trends Microbiol. 2003, 11(5):215-219. 39.Lambeth JD. NOX enzymes and the biology of reactive oxygen. Nat Rev Immunol. 2004, 4(3):181-189. 40.Lee JJ, Kim DH, Kim DG, Lee HJ, Min W, Rhee MH, Cho JY, Watarai M, Kim S. Toll-like receptor 4-linked Janus kinase 2 signaling contributes to internalization of Brucella abortus by macrophages. Infect Immun. 2013, 81(7):2448-2458. 41.Macedo GC, Magnani DM, Carvalho NB, Bruna-Romero O, Gazzinelli RT, Oliveira SC. Central role of MyD88-dependent dendritic cell maturation and proinflammatory cytokine production to control Brucella abortus infection. J Immunol. 2008, 180(2):1080-1087. 42.Martirosyan A, Moreno E, Gorvel JP. An evolutionary strategy for a stealthy intracellular Brucella pathogen. Immunol Rev. 2011, 240(1):211-234. 43.Meador VP, Hagemoser WA, Deyoe BL. Histopathologic findings in Brucella abortus-infected, pregnant goats. Am J Vet Res. 1988, 49(2):274-280. 44.Moresco EM, LaVine D, Beutler B. Toll-like receptors. Curr Biol. 2011, 21(13):R488-493. 45.Naroeni A, Jouy N, Ouahrani-Bettache S, Liautard JP, Porte F. Brucella suis-impaired specific recognition of phagosomes by lysosomes due to phagosomal membrane modifications. Infect Immun. 2001, 69(1):486-493. 46.Oliveira SC, de Oliveira FS, Macedo GC, de Almeida LA, Carvalho NB. The role of innate immune receptors in the control of Brucella abortus infection: toll-like receptors and beyond. Microbes Infect. 2008, 10(9):1005-1009. 47.Ozinsky A, Underhill DM, Fontenot JD, Hajjar AM, Smith KD, Wilson CB, Schroeder L, Aderem A. The repertoire for pattern recognition of pathogens by the innate immune system is defined by cooperation between tolllike receptors. Proc Natl Acad Sci USA. 2000, 97(25):13766-13771. 48.Pappas G, Papadimitriou P, Akritidis N, Christou L, Tsianos EV. The new global map of human brucellosis. Lancet Infect Dis. 2006, 6(2):91-99. 49.Pei J, Ding X, Fan Y, Rice-Ficht A, Ficht TA. Toll-like receptors are critical for clearance of Brucella and play different roles in development of adaptive immunity following aerosol challenge in mice. Front Cell Infect Microbiol. 2012, 2:115. 50.Pizarro-Cerda J, Meresse S, Parton RG, van der Goot G, Sola-Landa A, Lopez-Goni I, Moreno E, Gorvel JP. Brucella abortus transits through the autophagic pathway and replicates in the endoplasmic reticulum of nonprofessional phagocytes. Infect Immun. 1998, 66(12):5711-5724. 51.Porte F, Liautard JP, Kohler S. Early acidification of phagosomes containing Brucella suis is essential for intracellular survival in murine macrophages. Infect Immun. 1999, 67(8):4041-4047. 52.Porte F, Naroeni A, Ouahrani-Bettache S, Liautard JP. Role of the Brucella suis lipopolysaccharide O antigen in phagosomal genesis and in inhibition of phagosomelysosome fusion in murine macrophages. Infect Immun. 2003, 71(3):1481-1490. 53.Redfern RL, Reins RY, McDermott AM. Toll-like receptor activation modulates antimicrobial peptide expression by ocular surface cells. Exp Eye Res. 2011, 92(3):209-220. 54.Rittig MG, Alvarez-Martinez MT, Porte F, Liautard JP, Rouot B. Intracellular survival of Brucella spp. in human monocytes involves conventional uptake but special phagosomes. Infect Immun. 2001, 69(6):3995-4006. 55.Rodriguez-Martinez S, Cancino-Diaz ME, Cancino-Diaz JC. Expression of CRAMP via PGN-TLR-2 and of alphadefensin-3 via CpG-ODN-TLR-9 in corneal fibroblasts. Br J Ophthalmol. 2006, 90(3):378-382. 56.Rolan HG, Xavier MN, Santos RL, Tsolis RM. Natural antibody contributes to host defense against an attenuated Brucella abortus virB mutant. Infect Immun. 2009, 77(7):3004-3013. 57.Salcedo SP, Marchesini MI, Lelouard H, Fugier E, Jolly G, Balor S, Muller A, Lapaque N, Demaria O, Alexopoulou L, Comerci DJ, Ugalde RA, Pierre P, Gorvel JP. Brucella control of dendritic cell maturation is dependent on the TIR-containing protein Btp1. PLoS Pathog. 2008, 4(2):e21. 58.Sangari FJ, Aguero J. Molecular basis of Brucella pathogenicity: an update. Microbiologia. 1996, 12(2):207-218. 59.Scholz HC, Hubalek Z, Sedlacek I, Vergnaud G, Tomaso H, Al Dahouk S, Melzer F, Kampfer P, Neubauer H, Cloeckaert A, Maquart M, Zygmunt MS, Whatmore AM, Falsen E, Bahn P, Gollner C, Pfeffer M, Huber B, Busse HJ, Nockler K. Brucella microti sp. nov., isolated from the common vole Microtus arvalis. Int J Syst Evol Microbiol. 2008, 58(Pt 2):375-382. 60.Starr T, Ng TW, Wehrly TD, Knodler LA, Celli J. Brucella intracellular replication requires trafficking through the late endosomal/lysosomal compartment. Traffic. 2008, 9(5):678-694. 61.Tauszig S, Jouanguy E, Hoffmann JA, Imler JL. Toll-related receptors and the control of antimicrobial peptide expression in Drosophila. Proc Natl Acad Sci U S A. 2000, 97(19):10520-10525. 62.Tobias L, Cordes DO, Schurig GG. Placental pathology of the pregnant mouse inoculated with Brucella abortus strain 2308. Vet Pathol. 1993, 30(2):119-129. 63.Trombetta ES, Ebersold M, Garrett W, Pypaert M, Mellman I. Activation of lysosomal function during dendritic cell maturation. Science. 2003, 299(5611):1400-1403. 64.Ugalde RA. Intracellular lifestyle of Brucella spp. Common genes with other animal pathogens, plant pathogens, and endosymbionts. Microbes Infect. 1999, 1(14):1211-1219. 65.Underhill DM, Ozinsky A. Phagocytosis of microbes: complexity in action. Annu Rev Immunol. 2002, 20:825-852. 66.Vieira AL, Silva TM, Mol JP, Oliveira SC, Santos RL, Paixao TA. MyD88 and TLR9 are required for early control of Brucella ovis infection in mice. Res Vet Sci. 2013, 94(3):399-405. 67.Wanke MM. Canine brucellosis. Anim Reprod Sci. 2004, 82-83:195-207. 68.Weiss DS, Takeda K, Akira S, Zychlinsky A, Moreno E. MyD88, but not toll-like receptors 4 and 2, is required for efficient clearance of Brucella abortus. Infect Immun. 2005, 73(8):5137-5143. 69.West AP, Brodsky IE, Rahner C, Woo DK, Erdjument-Bromage H, Tempst P, Walsh MC, Choi Y, Shadel GS, Ghosh S. TLR signalling augments macrophage bactericidal activity through mitochondrial ROS. Nature. 2011, 472(7344):476-480. 70.Zwerdling A, Delpino MV, Barrionuevo P, Cassataro J, Pasquevich KA, Garcia Samartino C, Fossati CA, Giambartolomei GH. Brucella lipoproteins mimic dendritic cell maturation induced by Brucella abortus. Microbes Infect. 2008, 10(12-13):1346-1354.